"Cheer on the Cornhuskers with this Nebraska-inspired dip. 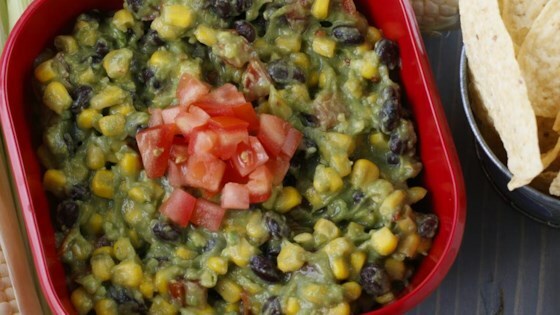 It's loaded with black beans, corn and authentic guac flavor, thanks to McCormick® Guacamole Seasoning Mix. Perfect for dipping with tortilla chips, it also tastes great on grilled meats and tacos." Stir Seasoning Mix and mashed avocados in medium bowl until well blended. Stir in corn, beans and tomato. Cover surface with plastic wrap. Not my favorite dip, but very tasty. I like it as a side dish more. The flavors all mix together well making a tasty dish to enjoy with friends or family.